Layne Nelson presents the history of Farmington using the stories of its people. 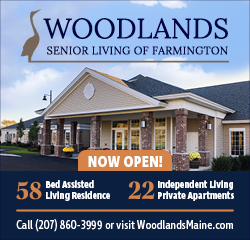 FARMINGTON - The University of Maine at Farmington’s university-wide, day-long, spring Symposium took place on Wednesday, displaying the depth and breadth of academic research and creative work by students from every corner of the university. The Symposium included close to 300 student presenters, mentored by nearly 50 faculty sponsors. These student research projects and original creative works are, “the product of hard work, inventiveness, financial support and deep commitment,” observed Kathryn A. Foster, UMF president. “Congratulations to all those who contribute to this unique day on our campus,” said Eric C. Brown, interim provost and vice president for academic affairs. Presentations took place in multiple venues throughout the UMF campus and included talks, poster sessions, readings, installations and performances. 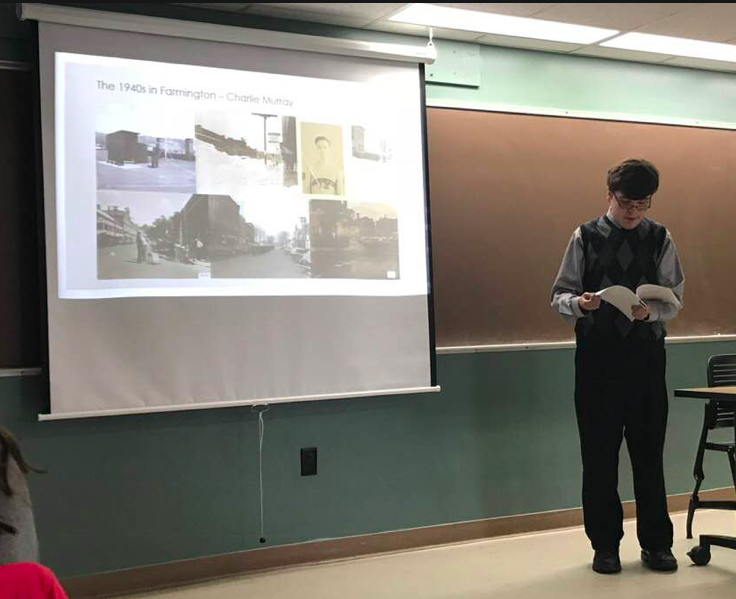 A presentation entitled “Farmington, Maine: Stories and History Told by Its People” given by Layne Nason attempted to piece together the past 78 years of the town's history using stories recounted by residents. Nason, a Geography major, interviewed 12 different people ranging from those in their sixties and seventies to an 18-year-old Mt. Blue graduate. "The interviews held with people who lived during the forties and fifties could pretty much give me a walking tour of the downtown area. The interviews with younger people were much shorter," Nason said. Another difference, he said, was the use of technology such as Snapchat and Skype for the younger generations, while the older generations met in person. The stories included snapshots of a Farmington that once was, including places such as The Exchange Hotel, Bonney's Restaurant, Mickey's Hallmark and the Farmington Diner. "The big event was to go downtown. Or uptown, depending on where you lived," Eloise Wallace said. Other stories included historical markers, such as the watchmen that stood post on the roof of the Post Office building watching for German invaders during World War II, or the time that President Eisenhower passed through town on his way to Rangeley, waving as he drove down Main Street. While others were marked by nature: the flood of 1987 and the ice storm of 1998. "There were some constants throughout the stories. The Farmington Fair was popular with everyone, swimming in the Sandy River or Clearwater Lake and skiing at Titcomb Mountain ever since it opened. And of course, UMF. Almost everybody mentioned UMF," Nason said. Highlighted presentations included Trustee Professor Jonathan Cohen on “The Music of Nietzsche’s Life” and Libra Professor Christos Teazis on “New Turkey: Towards a New Islam." Also spotlighted is the work of the 2017-2018 Michael D. Wilson Fellows and Scholars. The competitive Wilson Research Program helps top UMF student scholars, supported one-on-one by faculty mentors, pursue original, high-level undergraduate research projects. This year’s awardees include 2 year-long fellows and 18 single-semester scholars. The Michael D. Wilson Symposium is organized by the UMF Culture Committee.